Lady Sabre & The Pirates of the Ineffable Aether - Chapter 08, Part Eight: THUNDERSMOKE ROCKET SYSTEM Mk VI. 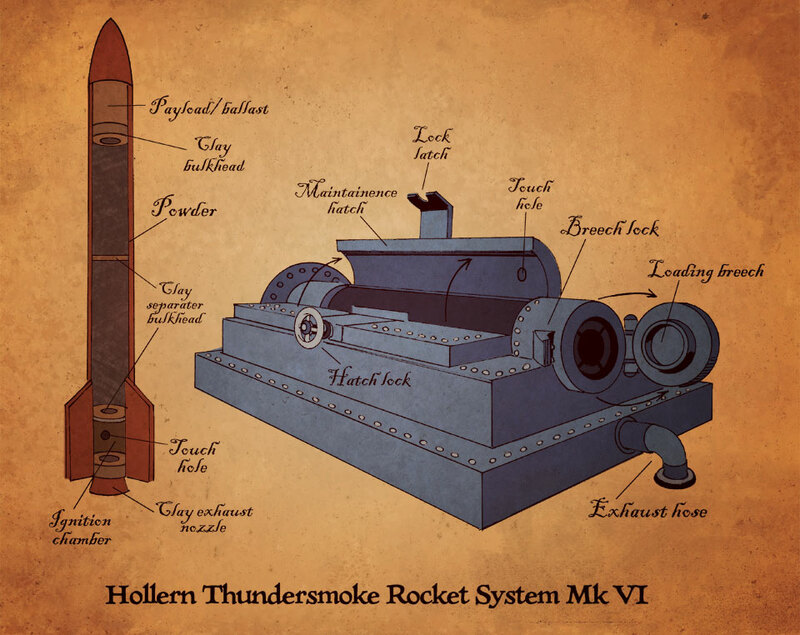 Chapter 08, Part Eight: THUNDERSMOKE ROCKET SYSTEM Mk VI. BLUEPRINT – THUNDERSMOKE ROCKET SYSTEM Mk VI. I’m loving these blueprint posts. It’s a little thing, but I like the depth it adds to the world y’all are building. I think you guys are absolutely brilliant. I realize it’s your art, your vision, and you can take this story wherever you want. And if I don’t like it, I can bail out whenever I want. But I am becoming increasingly disappointed. You had something so mystical and magical going here, especially the aether, it was like anything was possible, but instead you brought in the heavy guns and now it’s bang bang, kill kill. Nothing like a few Nazis to livin’ things up. But really, were they that necessary? Well, have fun. Ho hum. How does any of that take away from the mystical and magical? It’s not like they stripped that part away, they’re just adding more elements. Maybe you’ll like it better again once the ship battle is over. But really, these guys have been here since the very first strip. This has been here all along. Hollern has always been depicted as somewhat analogous to late 19th century Prussia. I make no apologies for our choices, though I am sorry to see you go. Looks like a recipe for disaster! Not included is any description of the time/range fuse. Option #1. small clockwork activated by launch acceleration. Time/Range dialed in before load/launch on warhead. Launch acceleration trips a switch/lever to start the clockwork. Option #2. buring fuse, cut/set to length before launch. Would be cut/set to length before placement in launch tube then ignited by the launch touch. You could do a #2/#3 hybrid by having some sort of locking slide on side of the rocket that set the crossover point where the burn from the propellant ignited the payload. Would be a quick fuse on the exterior of the propellant body that ran up to the payload. There would be an adjustable crossover point that allowed the propellant burn to crossover to the fast fuse, range would depend on where the crossover point was. This is excellent! Thank you – I like the 2/3 hybrid, most, I think. Hmm… we’ll be discussing this on Tuesday’s call, methinks! That launcher looks to be massively overbuilt.I wonder how many ships the fatherland have lost as they experimented and implemented this weapon system?Having one of those rockets running hot and failing to leave the tube makes me shudder. I for one one love the Prussian association.who does villainy better then a German guy with wickedly cool facial hair?I just hope they are not as incompetent as Stormtroopers versus Ewoks. Rick, Eric, and I actually discussed what happens when one of the rockets doesn’t clear the tube. You don’t want to be the guy who has to open the casing and clear the chute. The German V1 (buzzbomb) and V2 rockets of WWII would offer some insight into guidance and detonation possibilities. The V1 detonation method was a very straightforward mechanical setup, and the V2 guidance used movable graphite vanes in the exhaust stream.